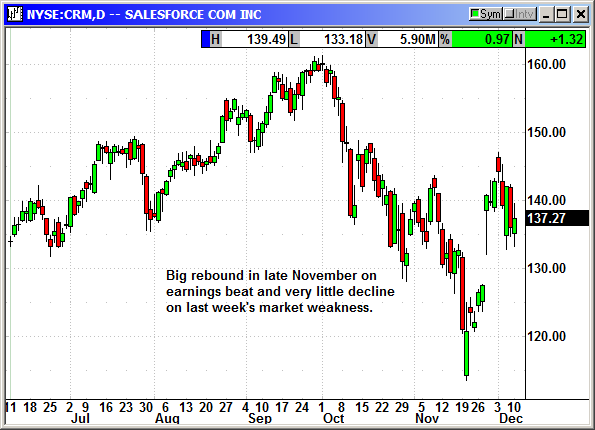 The market continues to be volatile and headlines are powering the moves. This should be an easy commentary because nothing has changed over the last several weeks other than the G20 meeting had no lasting impact. The clash of titans lifted the market for one day and even that was strained with the market closing well off its highs. The news of the arrest of the Huawei CFO killed what little bullish sentiment remained. The hope for a Chinese trade deal was dashed and a new problem arose to spoil the negotiations. The bail hearing for Meng Wanzhou failed to conclude on Monday and will resume on Tuesday morning. Meng and her husband offered to put up their two homes in Vancouver worth more than $12 million as partial collateral for her bail. She offered to be monitored electronically but prosecutors said it would be ineffective if she just walked onto a private jet and disappeared. Her husband's visa expires in February and the $15 million in cash and property would be a small price to forfeit for her to avoid charges that carry a 30-year prison term. She is worth hundreds of millions as the daughter of the founder of Huawei. The Chinese and US responses are on hold until the bail issue is settled, and Canada decides if they are going to allow extradition. To further complicate the market outlook the Brexit negotiations are falling apart. Prime Minister Theresa May postponed a critical vote on Tuesday and left the future of the split uncertain. Being unable to negotiate a smooth exit from the EU carries the potential for a hard Brexit and a material economic decline for the UK and many of the EU nations. Without agreements on trade, banking, borders and travel we could see the EU fall into a recession. There is plenty of talk of cancelling Brexit but they may be too far down the road for that. The worst case would be a hard break on March 29th that craters several economies. The current Brexit deal that has taken months to work out is probably going to fail given the cancellation of the vote. That will throw the negotiations into turmoil. 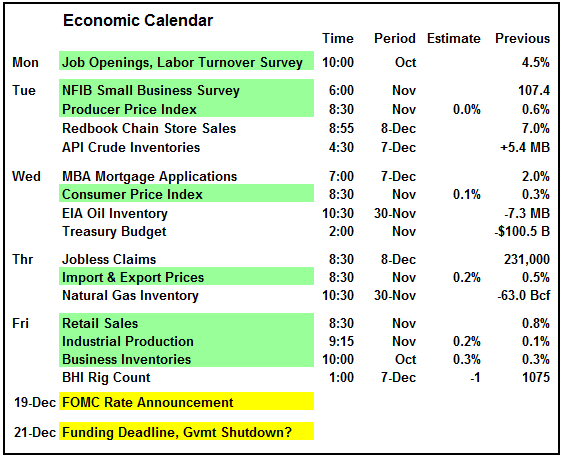 Added to those events above we have a Fed meeting next week where they are likely to hike rates. While that is almost a sure thing, there is growing hope by investors that they Fed will announce a pause in hikes for 2019 until the data firms and confirms additional hikes are the right path. The price indexes this week will go a long way towards swaying the Fed's opinion. Both are expected to fade, mostly due to the crash in oil prices. We also have the potential partial government shutdown next week. The battle lines have formed, and the odds are good there will be a shutdown battle. Shutting down the government three days before Christmas is never a good plan but the current republican majority changes in January. It is now of never on border security and wall funding. 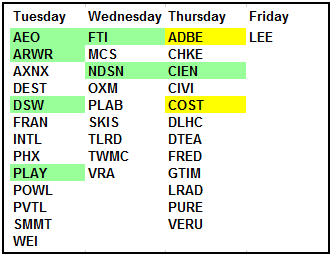 The earnings calendar is sparse other than Costco and Adobe on Thursday. 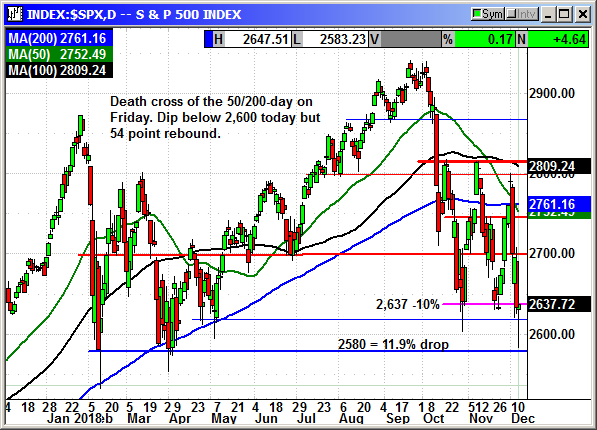 The S&P dipped 17 points under 2,600 to come within 3 points of decent support at 2,580. The 54-point rebound was spectacular but resulted in only a 4-point gain. S&P futures are down about 10 points this evening suggesting sellers are still circulating. The S&P closed at 2,637 and exactly a 10% decline from the highs. The Dow fell -507 points intraday to trade well under 24,000 but recovered at the close to avoid ending in correction territory. It was a surprising rebound led by Apple after the company said it had filed an appeal on the injunction on sales of iPhones by Qualcomm. Shares rebounded nearly $7 on the news. Falling oil prices and weak financials kept the index from a stronger rebound. 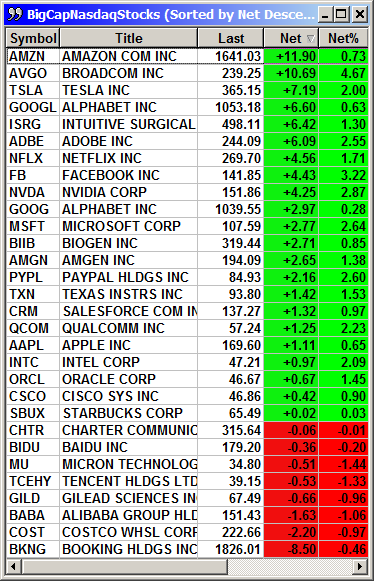 Only six stocks gained or lost more than $1 so basically the index just returned to the flatline. The Nasdaq was the strongest index with Facebook gaining more than $4 to lift the FANG stocks. 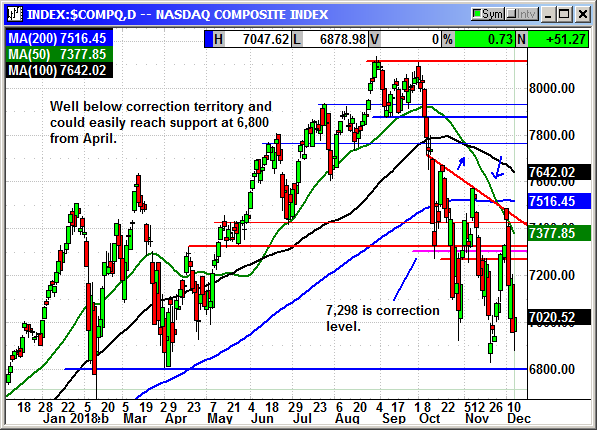 The rebound in techs came from 6,878 and the index has not yet tested the decent support at 6,800. It came close today, but buyers were waiting. All of the indicators are bearish, but rallies can begin unexpectedly. Despite the relative strength and the rebound, it was mostly the big caps doing the lifting. 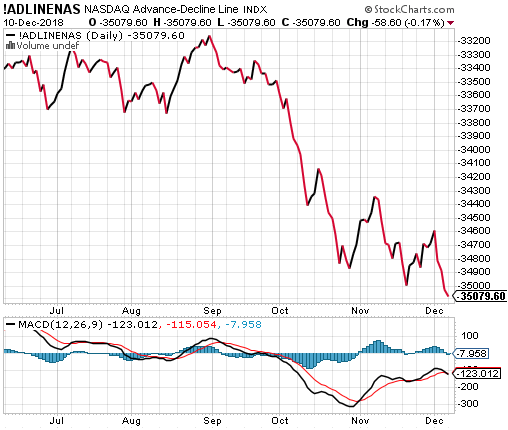 The broader index saw the A/D line make new lows. 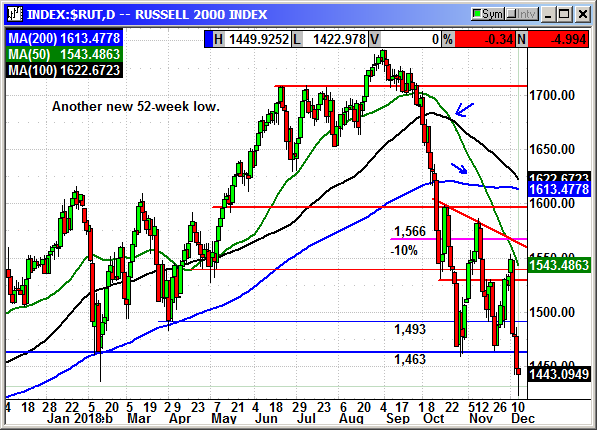 The Russell remains the weakest index with a new 52-week low close. There are a lot of factors impacting the small caps including rates, tariffs, slowing economic indicators, rising wages, etc. It would take a major change in sentiment to create a rally here. The path of least resistance is lower. The S&P futures are down about 10 points on Monday evening. 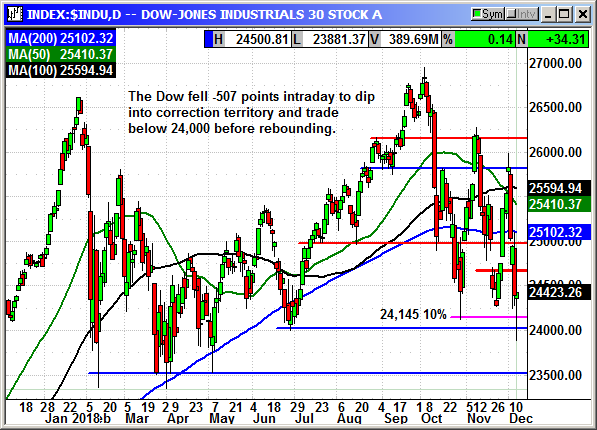 We have seen a lot of 500-point Dow moves reverse the next day. There is no conviction on either side and everyone is trading on reactions rather than fundamentals. The algo computers are causing the majority of the movement. Without any directional conviction, once the algos see a short-term trend they pile on and we get these huge moves. The next day all the computers are rebooted, and we start from scratch without any follow through from the prior day. I know the urge is strong to buy something, but I would try and resist until as actually have a trend. Note that the S&P has had six moves of 180 points or more in opposite directions since October. Adjusted gross profit of $2.6 billion came from gross margin o f76.9%. They ended the quarter with $3.45 billion in cash. Buy Feb $150 call, currently $4.05, stop loss $123.65. 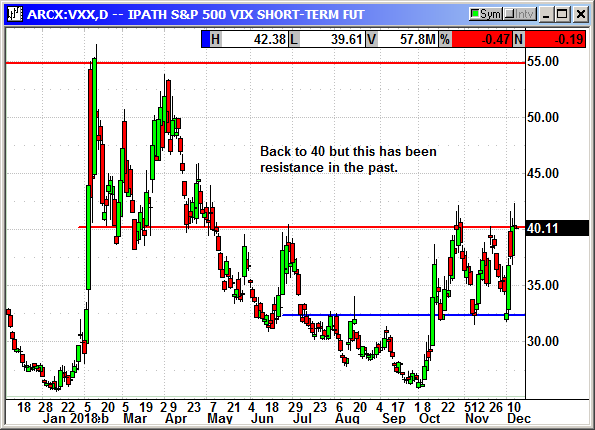 The VXX surged to 40 once again but that appears to be the line it will not cross unless the selling increases significantly. It will eventually go to single digits. We just have to be patient.